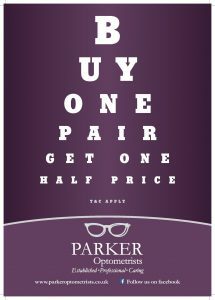 Buy one pair of glasses and get another HALF PRICE! Buy one pair of spectacles and get another HALF PRICE! Offer applies to complete glasses (frames and lenses) of the same prescription. Ideal for spare pairs and sunglasses! Terms & Conditions apply. See in store for more details. Our Summer Sunglass Offer is back....! Discover the new Silhouette Inspire Collection.